TWMLA is extremely pleased that Buffalo Harbor State Park was awarded the 2015 Environmental Project of the Year Award from the Western Branch of the American Public Works Association (APWA). 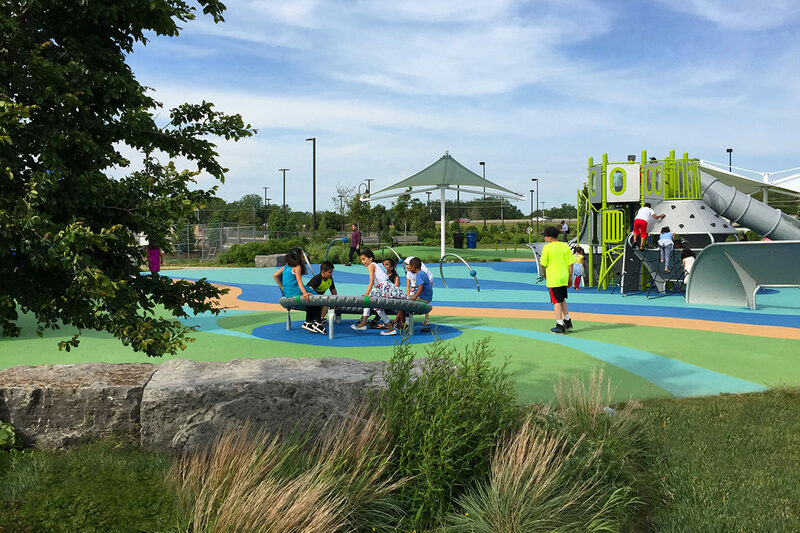 TWMLA teamed with WSP|Parsons Brinckerhoff to create a master plan and a multi-phased design and construction strategy for this new 200-acre park on Buffalo’s Outer Harbor waterfront on Lake Erie. The park was recently transferred from the Erie Canal Harbor Development Corporation to the New York State Park System, and will be fully built out over the next five to six years. Although the park already included one of the largest marinas in New York State, two boat launch areas, a restaurant and a large green space, it was an underutilized area with minimal capital improvement. The design team’s first goal was to enliven the large green space to attract regular visitors. To this end, TWMLA designed a destination playground, a concert stage and large, custom pavilions, which were constructed in 2015. Planted berms and landforms were created using on-site excavated materials to mitigate winds off Lake Erie and to create visual interest and topographic relief on the flat site. TWMLA selected native trees and shrubs that tolerate the harsh winter winds off the lake. The second and third phases of park improvements are underway, including a new entrance boulevard, new multi-use paths, and a new boat launch. The APWA annual awards recognize partnerships between managing agencies (owners), consultant/architect/engineer teams, and contractors who, working together, complete exemplary public works projects.